Double Glazed French Windows From the Advanced Group are second to none when it comes down to being simplistic, yet classic looking and well designed. Our windows are extensively tried and tested to ensure your windows are robust and durable. The spacer bar in our Double Glazed French Windows will afford you heat loss being reduced by up to 94% and they reduce condensation build up by up to 70% and this has a dramatic effect on your home’s thermal performance and will in turn reduce your heating costs, which means that in effect your new windows will pay for themselves in no time at all. Price Guarantee – The price we quote is the price you pay. Product Guarantee – All of our uPVC products are guaranteed for 10 years. Service Guarantee – We have been providing our Double Glazing products for over 22 years in Scotland. Our vast range of glass options, uPVC colours, and finishes ensure that you can pick the French Double Glazed Windows that will fit perfectly with the unique style of your home. 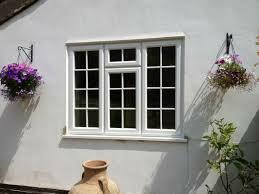 Double Glazed French Windows why us? With NIL deposit finance package available, our replacement windows have never been more keenly priced and you only pay when you are completely satisfied. Couple this with any of the offers or promotions we usually have and you will be making even more of a saving on your double glazed french windows.